While it is true that academics wet themselves over his plays, the wonderful thing about Pinter is how many people can relate to his work. Once in a while good things happen to those who deserve them. Thursday’s announcement that Harold Pinter had been awarded the Nobel Prize for literature is in my mind one of those happy occasions. The Swedish Academy, the group responsible for choosing the award winner, cited the playwright’s ability to ” uncover(s) the precipice under everyday prattle and force(s) entry into oppression’s closed rooms”. I think that means he’s a dab hand at writing dialogue; especially stuff with a little bit of hidden meaning. 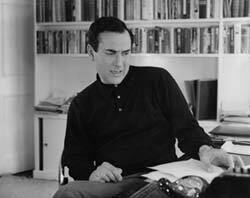 Harold Pinter has written over thirty plays, a variety of poetry, novels, and screenplays. Almost more important than the quantity of work he has produced, is the impact his work has had upon contemporary theatre. “Pinter did what Auden said a poet should do. He cleaned the gutters of the English language; so that it ever afterwards flowed more easily and more cleanly…The essence of his singular appeal is that you sit down to every play he writes in certain expectation of the unexpected. In sum, this tribute from one writer to another: you never know what the hell’s coming next.” David Hare in Harold Pinter a Celebration Faber and Faber 2000 p.21. While Samuel Becket was the first playwright to use pauses in conversation as integral parts of dialogue, it was Pinter who took the concept into the mainstream. His keen ear for dialogue and sense of dramatic timing allowed the lack of conversation to become as dramatically important as any dialogue. What goes unsaid between two people, what is implied; sometimes conveys more truth than words. Pinter understood this and used the pauses in his scripts to increase tensions between characters, extend emotional moments, and add an overall air of authenticity to the work. We’ve all heard the expression, “Less is more”; well, to see a Pinter play on stage is to experience that statement. There is never a word out of place, or an extraneous piece of dialogue. Pinter’s work has been described as something called “Comedy of Menace”, suggesting an underlying threat pervades the majority of his work. He is sort of an anti-thesis to what “The Monty Python” troop used to do. They once described themselves as taking an illogical premise to very logical conclusion, which resulted in their rather twisted humour. Pinter takes the logical and common place and carries it to an illogical and terrifying conclusion under the guise of humour. What could be more harmless than a person’s birthday party? In Pinter’s play The Birthday Party we discover how even that innocent occasion can be perverted to suit the needs of dangerous individuals. Stanley lives at a quiet seaside boarding house run by Pete and Meg Boles. One day two strangers, Goldberg and McCann, show up and insist on organizing a birthday party for Stanley that very evening; despite his claims that it’s not his birthday. For some reason these strangers are after Stanley. Come the morning they haul him away promising to make him a better man. Goldberg: We’ll make a man of you. McCann: You’ll be a success. Reading those lines outside the context of the play they sound quite silly and absurd. But when the men speaking them have spent the past evening terrorizing their subject, and are now forcibly removing him from his home, their flippancy only adds to the menace of the situation. I’m sure that up to this point my description of the man and his work have made Harold Pinter come across as just one more in a long line of inaccessible Nobel laureates. If you don’t have a doctorate in theatre or English your chances of enjoying his work are minimal. While it is true that academics wet themselves over his plays, the wonderful thing about Pinter is how many people can relate to his work. At one point in my theatre career I was teaching acting classes for young offenders at a detention centre. I was actually able to get a couple of the guys interested in performing one of Pinter’s review sketches; a piece called Trouble in the Works. I don’t know if you know how hard it is to get any teenager up in front of an audience willing to risk making a fool of him or herself, but multiply that by ten thousand and you may begin to understand the attitude of young offenders, and the importance of cool to them. They, or at least the ones who wanted to, thought the piece cool enough, or could relate to it enough, that it was worth risking losing face in front of their peers to get up and perform. To me that is proof of Pinter’s ability to communicate to any audience. Harold Pinter was probably one of the most influential English language playwrights of the late twentieth century. His work established precedents for both realism and absurdity in contemporary theatre. He proved that theatre does not have to be overblown spectacle to draw an audience and that it could be both experimental and commercially successful simultaneously. Hopefully the awarding of the Nobel Prize for literature to Harold Pinter will encourage producers and artistic directors to consider staging his works more often. They are some of the finest pieces of theatre written in the English language and deserve to be performed more often than they are now. If you ever have a chance to see any of his work staged professionally do not pass up that opportunity. It will change your perceptions of the English language forever.